This paper suggests that although carceral space seems to be sharply demarcated from the outside world, the prison wall is in fact more porous than might be assumed. The paper critiques Goffman’s theory of the ‘total institution’ by deploying a geographical engagement with liminality to theorise prison visiting rooms as spaces in which prisoners come face-to-face with persons and objects which come from and represent their lives on the ‘outside’. Drawing on a specific empirical example from recent research into imprisonment in the contemporary Russian prison system, it uses the example of visiting suites designed for long term ‘residential’ visits to explore the ways in which visiting spaces act as a space of betweenness where a metaphorical threshold-crossing takes place between outside and inside. The paper specifically explores the expression of that betweenness in the materiality of visiting, and in the destabilisation of rules and identities in visiting space. It contests the sense of linear transformation with which liminal spaces have previously been associated, suggesting that rather than spaces of linear transition from one state to another, liminal spaces can constitute a frustratingly repetitive, static or equilibriating form of transformation which is cumulative rather than immediate, and relates this suggestion to the wider study of prison visitation. The UK Economic and Social Research Council provided funding to Judith Pallot, Laura Piacentini and Dominique Moran for the conduct of the research leading to this article. A Visiting Fellowship at the Aleksanteri Institute, University of Helsinki, provided support to Dominique Moran for the preparation of the article. 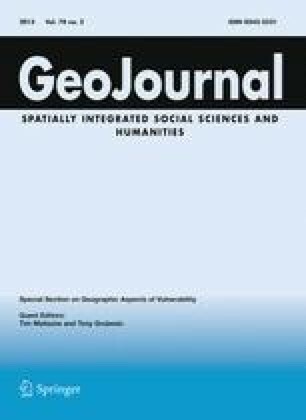 I would like to acknowledge the contribution of Judith Pallot and Laura Piacentini to the thinking which supported this article, and to thank members of the Department of Geography, University of Oulu, Finland, for helpful comments on an earlier draft. Dixey, R., & Woodall, J. (2011). The significance of ‘the visit’ in an English category-B prison: Views from prisoners, prisoners’ families and prison staff. Community, Work & Family. doi: 10.1080/13668803.2011.580125.